Flourish Africa, a self-help and women empowerment platform founded by Mrs. Folorunso Alakija, Executive Vice Chair of Famfa Oil and designed to encourage women from all walks of life to achieve their fullest potential is set to launch its inaugural conference on the 25th of November, 2017, from 9 am to 5 pm in Lagos Nigeria. Through inspirational keynote addresses and enlightening panel conversations, the conference will draw from the experience of specially invited female audiences to learn the secrets of how to live a balanced life in order to help them thrive. 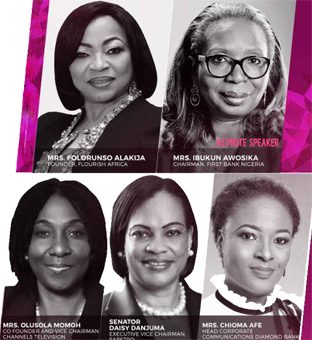 Delivering the keynote address is First Bank’s Chairman, Ibukun Awosika who will be joined by an impressive list of accomplished women across various sectors including Mrs. Olasola Momoh, Vice Chairman of Channels Media Group and Senator Daisy Danjuma, Vice Chairman of Sapetro. Other speakers include Mrs. Chioma Afe, Head Corporate Communications Diamond Bank, Patricia Obozuwa, Chief Communications officer GE Africa, Mrs. Ayo Megbope- Founder of No Left Over Nigeria, Uche Pedro- founder Bella Naija and many more. Hosted by the newly appointed Head of Digital Media and Partnerships, for Forbes Africa, Peace Hyde, the Flourish Africa conference is a unique gathering of powerful and thought provoking leaders assembled all over Nigeria to share their knowledge and expertise on several topics affecting women. The Flourish Africa platform seeks to provide a medium where an exchange of ideas can take place with the view of empowering and inspiring women from all walks of life. In this forum, guests and speakers will be able to connect and interact initiating a one-of-a kind free and open dialogue. “Given the challenges women face in developing fulfilled and purpose driven lives, it has become essential to create a medium that will aid in the facilitation of knowledge transfer between women on the continent to help them flourish and become what God has destined for them to be”, says Mrs. Alakija. “I believe that when a woman helps another woman they both benefit and when they contribute to their full potential, societies grow and economies also grow. Come and let us flourish together” Folorunsho Alakija goes further to mention in her founder’s message on the online platform.